Share counts are important for showing your social proof. In case you have a problem with their work here you may find the most common situations. Active Cache plugin/server compatible mode from Social Sharing -> Share Counters Setup if a cache plugin is used. This mode makes possible to do a background counter update during the period when your cache plugin is showing a static content. This will avoid generating a too many requests for counter update when cache time expires. Twitter remove their official counter a few years back. 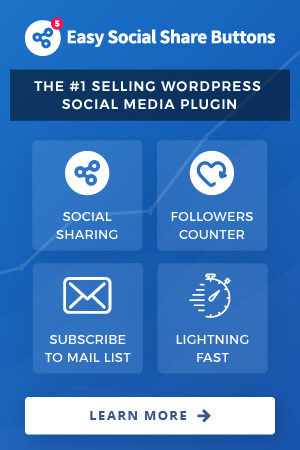 Inside plugin you have option to show Twitter share counter provided by an external service like opensharecounts.com or twitcount.com. In addition you have the chance to show internal share counter. To activate display of your Twitter share counter visit Social Sharing -> Share Counters Setup -> Single Button Counter and in the Twitter share counter menu select the mode of work. In case you choose and external service please be sure to visit their site and complete the requirements for share counter activation for your domain (or counter will not appear). 5. My share counters are not accurate or not showing. What to do? A button share counter or total share counter shows NaN as a value. That usually results of real-time share counter usage. The real time share counters are good for test and small sites but they are not recommended for real life usage sites. The real time update does a call on each page load to a social API – with the existing connection rates applied by social networks after a period of time you may start seeing this message. Also this may result because of a social network remove the official counter value from their API. Do you make a change inside your URL structure? The most common change that is made is switching for example to SSL (https). If so than your share counters will reset because networks count the shares using URL as a unique key. We have a quick solution for that with activation of the share counter recovery. This you can do from Social Sharing -> Share Counters Setup -> Share Counter Recovery. All steps for the most common share recovery when switching to SSL (https) you can find here. Do a share counter from the System Status menu. Learn more for System status here. In case non of above help you solve the problem you have you can start a topic inside the official support board.